As a Bethel University instructor, I enter each new course believing that my students are competent and capable. What they may not be, however, is confident in their own abilities to manage people or processes—which is what the MBA program at Bethel University is all about. With over 20 years of experience in the fields of Organizational Development and Human Resource Management, I know that individual success hinges on self-confidence. My goal as an instructor is to guide students toward independent decision-making– to lead them toward self-reliance and trust in their own abilities. There is a quote by the Greek philosopher Socrates which sums up my own beliefs about education: “To find yourself, think for yourself.” This might seem contrary to the mainstream idea of what an educator does and is, but andragogy — the preferred learning model used at Bethel — is founded on the principle that adults already know how to learn; they simply need the opportunity and the guidance to do so. My aim as a facilitator is to provide students with the tools that they need to succeed, while also giving them the latitude to explore their own paths to success. I think of myself as a guide, not just a teacher — trusting, supporting, and leading students to personal and professional success. Confidence in education is not achieved by telling students what to think, but instead by showing them how to think. Even mistakes lead to competence, and over time, good decisions lead to confidence. 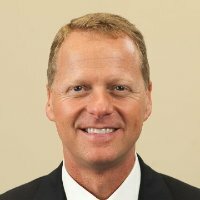 Dr. Brett Gardner teaches Organizational Development and Human Resource Management for Bethel University. He believes that practical application is the essence of the Bethel program, and aspires to encourage independence and confidence in all his students. This entry was posted in News and Information on March 31, 2014 by bethelu.